Celtic wedding rings have been getting ever more popular in recent years. In fact, Celtic knotwork wedding rings have become even more popular than Claddagh rings in Ireland. Throughout history, the circular shape of wedding rings has signified the endless love between two people. 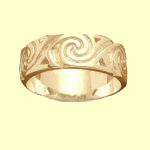 But Celtic wedding bands add to the traditional symbolism the strong connection to Celtic tradition with their unique Celtic design. Your Celtic wedding rings will show the world that you're not only proud of your marriage, but proud of your Celtic heritage as well. The most common design found on Celtic wedding rings is a continuous row of intertwined knots with no beginning and no end. The knotwork pattern was perfected by the Celtic Christians and monks and used as an elaborate ornamental symbol to adorn medieval Celtic bibles and crosses. The Celtic knot later came to symbolize the weaving together of two lives. The Celtic people believe that all things in life were interconnected. According to Celtic tradition, there is a specific way to construct the knot. Most importantly, the line of the knot must never be broken. Also, the weave of the knot must be perfectly symmetrical, with a continually repeated over and under pattern. Click here to read "Celtic Knot Symbolism : The Quest for Meaning"
There are different knotwork designs which represent different aspects of life such as love, desire, friendship, trinity, encouragement, wisdom and hope. Another less common pattern found on Celtic wedding bands is the Celtic spiral, which is said to symbolize a oneness with the universe. Click here to read "The Ancient Mystique of Celtic Spirals"
The workmanship and detail found in Celtic jewelry is astounding. Before making your selection, you may want to be sure it has been handcrafted in Ireland. Wedding rings stamped with the official hallmark of the Irish Assay Office, located in Dublin Castle, are certified authentic. The hallmark stamp indicates the year the piece of jewelry was created, and the hallmark ensures the quality and authenticity of the gold. Wedding rings with Celtic designs are available individually or in sets; a ring or band for the bride and a band for the groom. They are made from several types of metals including platinum, gold, white gold and silver. They are available in an open weave design, or the knot patterns can be set on top of a solid background. So you'd like to exchange Celtic wedding bands but have a limited budget? You don't have to get cheap imitations to save money! You can get authentic Celtic wedding rings very reasonably priced at stores like My Celtic Jeweler, The Celtic Store, and Creative Irish Gifts . One of the best places to buy Celtic wedding rings online is My Celtic Jeweler. 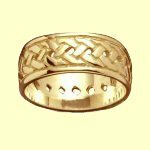 Not only will you find a unique variety of Celtic wedding rings, including a wide selection of Celtic knotwork and Celtic spiral designs; you'll also find several that are distinctively Irish, including many with the legendary Claddagh design. The national assay office at Dublin Castle individually tests and hallmarks each piece. This means your rings from My Celtic Jeweler have been certified as authentic Irish Celtic wedding rings. The only downside to buying from them is you may have to be patient. Their Celtic wedding rings are not just sitting in a warehouse waiting to be packed and shipped. Instead, your order is crafted after you order it, which takes a few weeks. But remember, good things come to those who wait! And you need time to plan the wedding anyway, right? Once your order arrives, you'll be glad you waited. You'll have Celtic wedding rings handcrafted by a traditional artisan in Ireland...priceless! I also like the quality and variety offered by The Celtic Store. The Celtic Store has been doing business online for over six years and they offer quality Celtic jewelry at very good prices. Although this is "Fantasy-Ireland" and they are in Scotland, I was impressed by the wide selection of Celtic rings they had. Compared to jewelry prices at your local shopping mall, I think you'll be pleased with their prices as well. You'll even get a 10% discount if you become a repeat shopper! Creative Irish Gifts was founded for the sole purpose of providing financial support to the Irish Children's Fund. This non-profit organization's mission is to work with at-risk children in the most troubled areas of Belfast. They are permanent expressions of your unique relationship. They are the perfect choice for couples who are moved by Celtic symbolism, music, and art. Quality Celtic wedding rings are not only unique symbols of who you are as a couple, but they, like your love, will last through the ages!